Innovations with Ed Begley Jr. Announces Upcoming Episode Featuring Power Monitors Inc.
DMG Productions explores the latest breakthroughs in power solutions. 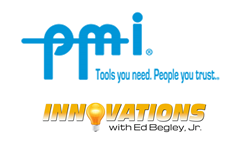 Innovations w/Ed Begley Jr., announced today that they will feature Power Monitors, Inc. (PMI) in an upcoming episode, airing second quarter 2016 via Discovery Channel. Dates and show times TBA. PMI is the leading manufacturer of state-of-the-art power quality analyzers and wireless power quality test equipment for residential, commercial, retail, institutional, industrial, and substation applications. This segment of Innovations will educate audiences on PMI’s wide range of services, including 24/7 Tech Support, industry-leading power quality training, and a robust line of compact, wireless power quality test equipment and software. PMI specializes in applying advanced technologies to develop state-of-the-art power quality recording solutions for residential, commercial, retail, institutional, industrial, and substation applications. PMI solves power quality problems by listening to customers and working with them to design and manufacture the best power quality products on the market. For more information, visit: http://www.powermonitors.com.